Spring, it's everywhere we look. Nature awakes from a long winter's nap and the miracle of new life is all around us. 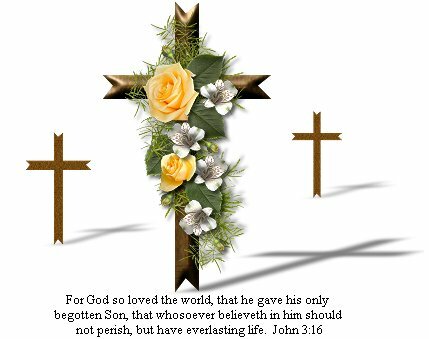 The greatest miracle of all is the celebration/holiday that most Christians refer to as Resurrection Sunday, the day Jesus Christ, God's precious Son arose out of the grave, conquering sin and death once and for all! Throughout my lifetime, I have heard people ask the question, "Why was this so necessary?" Because of my sins and your sins. God created man in a perfect world, only asking man to love and obey Him. But through temptation and the God given free will, man "chose" to sin. Man no longer walked in perfect harmoney with God, because sin had now entered this perfect world. The Holy and Almighty God could not have fellowship with sin. Romans 6:14 says, "What fellowship can light have with darkness?" The price for sin could not be paid with just any sacrifice, it had to be as God, PERFECT. So God promised a Messiah, a Savior who would redeem the sins of all mankind. Before the coming of the Messiah, God's people showed their faith that God would indeed send a savior, but until then, made burnt offerings and sacrifices as sin offerings. The priests sacrificed lambs, but they must be perfect, without spot or blemish to be acceptable to God. But hey, don't take my word for any of this, see it for yourself in God's infallible word! On the following page is a collection of poetry that is most appropriate for the seasonEnjoy! take a look at this magnificent site by Campus Crusades for Christ! prophecies fullfilled in the New Testament. THE CRUCIFICTION OF JESUSA beautiful story of the crucifiction in pictures. A special thanks to Joy Graphics! Please be sure to stop and sign my guest book on the way! Thanks! The Savior in this most blessed of seasons!